An excellent and spacious apartment close to the beach. The property is beautifully situated in a short cul-de-sac off Mullins Road. The Mullins beach is a pleasant 12 minutes walk away with the exceptional Gibbs beach being 15 minutes walk away. Holetown with shops and restaurants is about 15 minutes away by bus or by car. The apartment itself benefits by being on the first floor. It has an exceptionally large master bedroom with a good size en suite bathroom. The second bedroom is slightly smaller and is equipped with two single beds. There is a separate bathroom/shower room. 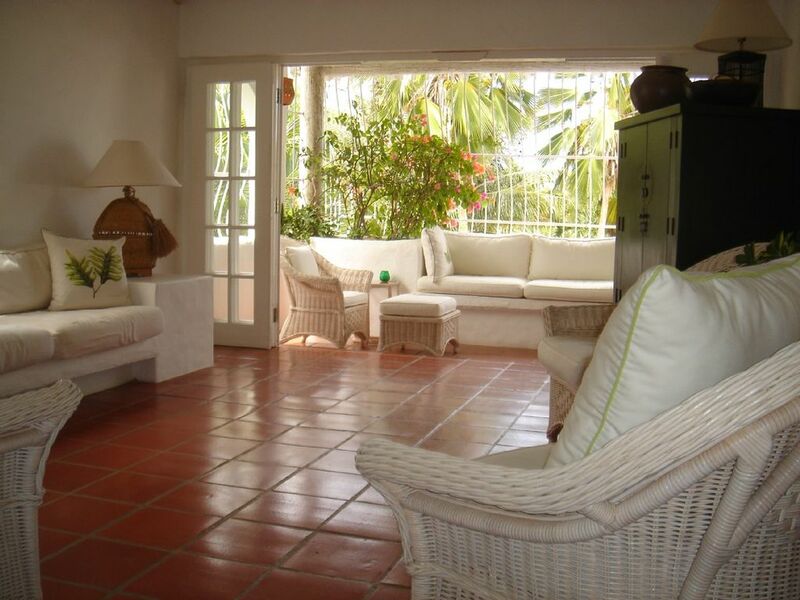 The Kitchen is well equipped and leads onto a spacious lounge area with a long sofa and several large chairs. There is a large flat screen T.V. An especial feature of the property is that both the living room and the master bedroom have folding doors leading onto a balcony running the entire width of the property. Part of this area is equipped with sofa seating and part with a dining table with four chairs. There are beautiful views over the swimming pool to the backdrop of palm trees and bougainvillea. There is front parking for each of the 4 apartments. The apartment was very nice and a great area to stay in. It was just a short walk to Mullins Beach and was in a convenient location. The staff that worked here was great and were able to answer all of our questions and took care of any issues that needed attention during our stay. Fabulous breezes day and night. Extremely comfortable and spacious apartment in a peaceful location. Excellent location within easy walking distance of beautiful beaches. Good quality restaurants and supermarkets just a short drive. Very welcoming staff who kept the place very clean and tidy. Great balcony overlooking pool where we enjoyed watching the birds and green monkeys who passed by most mornings. Good base for exploring all the tourist attractions on the island and a relaxing place to come back to at the end of the day. My husband and I just returned from our AMAZING visit to Barbados. The condo we stayed in was perfect. Very clean and very well maintained. Getting to the condo was an adventure...but once we found it we were greeted by Waterman the grounds keeper. He showed us around and gave us suggestions of where to snorkel and such. The condo is very large and comfortable. the balcony overlooks the swimming pool and the ground with a pool hours and beautiful. We enjoyed watching the monkeys in the morning. Several times a week we would see the housekeeper who is very very nice and helpful. The kitchen is great with coffee maker,blender, microwave. Lots of pots and pans for those who plan on cooking up their catch of the day. The king bed in the master bedroom was great and very comfortable. The second room has two twin beds. Both bathrooms are large and clean. The walk to the beach is only about 5 minutes away. Food markets are not too far away...we liked the Massey store in Holetown best. Having a car is very helpful to get to all the places up and down the West Coast. We would go to different beaches everyday to snorkel and spearfish. Folkstone Reverve is only about 10 minuets drive and is a great place to snorkel....no fishing allowed at Folkstone. Whenever we visit a new place we always ask ourselves if we could come back and would we stay in the same place. My husband and I say YES to both would would not hesitate to rent the same condo and we are already looking forward to going back to Barbaos. Thank you for your review. We were pleased to hear you enjoyed your stay at Casablanca. Late availability specials - email for last minute deals or make us an offer! Maid services every four days. Daily maid services available on request payable locally. Laundry/towels included. Gardener.